[FREE Book] Get this #1 Best-Seller for Coaches FREE Today! - Coach & Grow R.I.C.H. [FREE Book] Get this #1 Best-Seller for Coaches FREE Today! I wanted to give you a heads-up on this awesome resource for coaches you can get at no charge today. Free #1 Best-Selling Book for Coaches – Get it now. My friend and business buddy, Christian Mickelsen is currently giving away his #1 Best Selling Book, “GET CLIENTS TODAY” for free. When you opt-in to get the book for free you’ll also receive pre-written “Client-Getting Emails” that you can start using right away. You can use them on Facebook or send them out to your email list for an immediate rush of folks wanting to work with you. Get your free book and pre-written client-getting emails here. …I recommend you jump on this today. You’ll be blown away when you discover how easy it can be to start attracting your ideal clients right away. 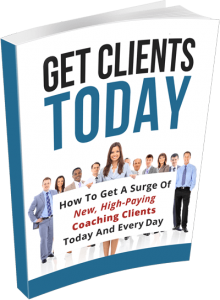 Download your Free Book and pre-written “Client-Getting” Emails NOW!